Can you imagine getting a cheap yet agile and powerful racket? Some people would say it’s not possible, but the Yonex Voltric 1DG is here to prove them wrong. 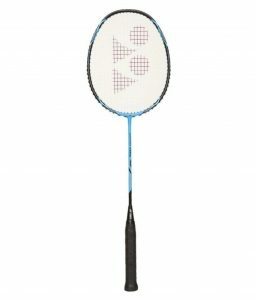 For a very affordable fee this racket can be yours, which makes it perfect for casual players and beginners. It’d be silly to compare it to the Voltric 80 or 70. Although, regardless of its low price, it still offers you an excellent performance. Want to know more about it? Then come with me and allow me to show you the benefits of this racquet. Dirt cheap. It’s one of the most affordable rackets in the market. Decent power. Enough for effortless clears and decent smashes. Great isometric frame. It allows you to score more successful shots. Once again, in the department of cheap rackets, the Voltric 1DG is an excellent choice. It provides you with decent power and very nice features that will provide you an excellent game experience. It may not be enough for advanced players, but for beginners it’s an excellent choice. It’s cheap and does the job, what else could ask for? In case you want to know more about it, just keep reading so you can learn more about it. The blue color and black spots in the frame make it look pretty well. Regardless of being cheap, Yonex has done a fair job in making this racquet visually attractive. As with all Voltric rackets, it comes with the Tri-voltage system. It brings you excellent power paired with amazing handling and maneuverability. It may not be the best Yonex badminton racket, but for sure it’s a good one for its price. Great hitting and fast swings. The combination of the Aero and Box frame make it great at the hour of hitting the shuttle and also brings you excellent swings during the game. Say good-bye to torque and welcome more accuracy. Thanks to the built-in T-joint it can reduce torque and bring you more control over the shuttle, because thanks to the reduce-torque you get more stability for the shuttle while on the string bed. Excellent gripping. Thanks to the control support cap you get a 88% wider surface which makes gripping much easier and maneuverability outstanding. More successful shots. Thanks to the isometric design of the frame it will be easier to land more successful shots, and yes, it also applies to total beginners. All these features come into play to create a great budget-friendly racket. It may not be as good as the Yonex Voltric 80, Voltric Z Force 2 or a Nanospeed 9900, but for the price it’s an excellent choice. I’d never recommend this racket to any serious or advanced players, but for beginners or casual players it’s an excellent choice due to its low price and well-rounded performance. Now it’s time to review its performance during the game. Serving with this racquet feels very well. You can hit the shuttle far and with precision, which is exactly what you need. As usual, just like all Voltric racquets, the clears are effortless and can go very far. It’s due to the nice hitting power. Smashes are alright. They won’t leave you speechless, but they are relatively easy to shot and they go with some serious power. They may not be as strong as with Voltric 80, but they are pretty decent. If you want to improve this and make its head heavier, in order to achieve higher hitting power, then you can add lead tape to the head and you will obtain better results. Just take into control that balance will suffer, and for beginner players, it may be an issue. Drives are pretty fine. In the defensive department they are good and in terms of defense it does a pretty good job. It’s good when it comes to lifts. It may not be as good as a Nanoray Z Speed in defense, but it’s pretty good especially for the low price. It’d not expect this racket to stop very powerful net shots from a strong player, but in the league of beginners it’d do a good job. Other than that, it is fast and therefore will work well when defending shots in this range. Moreover, it has a good performance with offensive shots. As you can see this cheap racquet is a pretty good choice for beginners and casual players. It comes with many good features that will provide you a great experience. Again, it’s not recommended for advanced players, but for the price you cannot really complain. it is very nice racket and feel comfortable when smashing serving and all, compared to any other rackets its looking very good I liked it very much.